Follow the steps below to show three Genesis Featured Pages widgets in the second section on Parallax Pro's front page. Sridhar I can’t recall which tutorial request you had asked me for the website link so here it is http://www.acauseforcelebration.me/. Its bare bones on purpose since I have it live. To many information vampires lurking around lol. I’ve implemented all the tutorials I’ve requested (gravity optin form below header, 3 column widget in section 2 and added 3 column footer widgets footer, the area before the footer credits) and they all work. I submited 2 additional tutorials yesterday but did not get any confirmation that you received them. Can you let me know if you did? 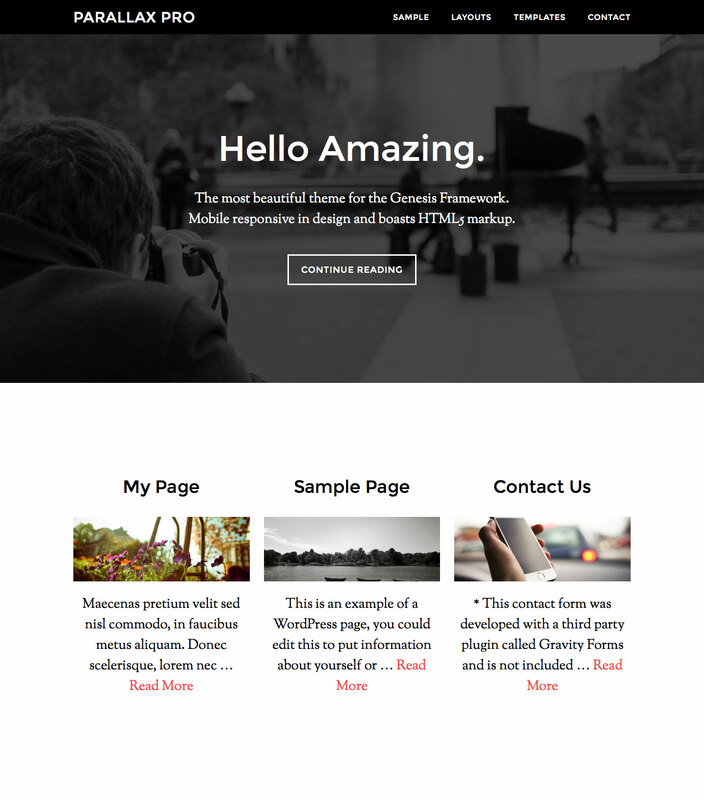 I am using this tutorial on the Genesis Sample theme to create 3 separate widget areas on the home page. I registered widgets for home-middle-1, home-middle-2, home-middle-3, home-bottom-left, home-bottom right and home-bottom . The widgets all show up in Appearance>widgets but I can’t get them to show up on the home page. I want widgets home-middle-1, home-middle-2, home-middle-3, to show up below header, widget home-bottom-left and home-bottom-right below this and home bottom after this. Can you help? PS I used the tutorial How to apply Parallax effect from Parallax Pro in any Genesis theme if that matters any. Great tutorial, just what I was looking for! The only problem I have is, the featured image for the first widget is bigger than the following two, see the screen grab below. Have I missed something? I’ve set all the featured images in the widget to 768×281, the only way to fix it is to actually make the image 768×281 which I have done for now.